What does it mean to me a writer? To be the person who sits for many hours in a trusty chair, at an oak table pressed up against a wall or looking out on a busy street, or a canopy of trees, hoping that their blood, sweat and hours of solitude may be reduced to those pages that we so love to read. Interest has always been placed on the way in which an artist or writer lives, the Guardian back in 2007 did a long series on the Writers’ room which can be viewed online, allowing us to indulge and gawk at the images before us, we can even see where Jane Austen sat and wrote, along with Charles Darwin and Roald Dahl. This obsession with wanting to know where the magic takes place has been on my mind recently, as I too gawk at the images before me, forcing me to take a look at my very own situation. I sit at my father’s bureau as I write this, I have it on loan, but knowing the way that fathers are, he will probably allow me to keep it as I’ve grown terribly attached to it. He sat at this very desk as he studied law, and now where his space filled, mine has replaced. He packed away two fountain pens for me in an old olive green felt Parker case, possibly anticipating the failure of my Waterman nib due to excessive use and undue pressure placed upon it. Upon this trusty desk sits an extra compartment that I had made by my sister, in it and upon it I’ve placed photos, one of Arthur Rimbaud, known as the original enfant terrible, an incredible poet and visionary. I have a photo of my typewriter and Virginia Woolf amongst flowers which I always insist on having near me. I have a penchant for looking after Orchids and Begonias’, so they are always with me. The painting by my desk was done by my father, I brought it back from Cyprus as I fell in love with it, it goes everywhere with me. 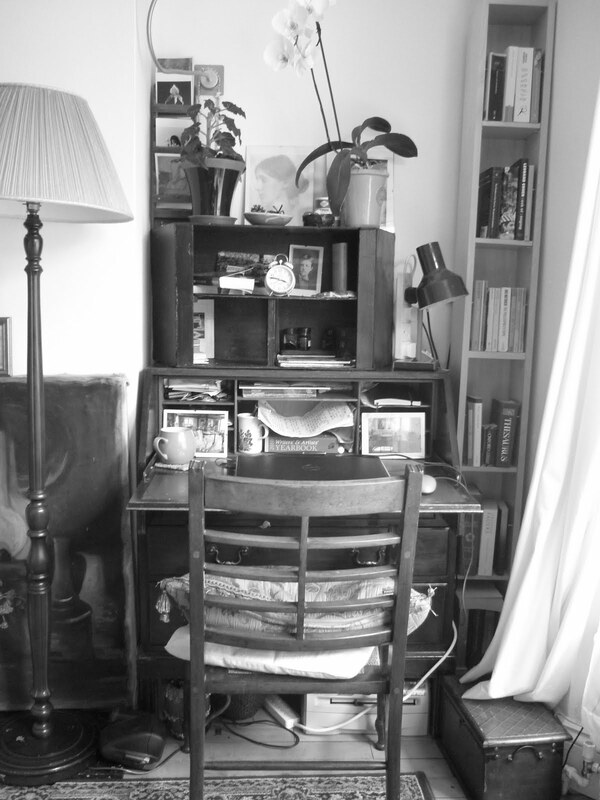 This hardy desk rests against the wall, a corner in my living room which has been taken over by my books and shelves piled up upon one another, threatening to take over the entire room. There is a window to the right of me looking out onto a quiet street, the slow flow of traffic and pounding of footsteps along the pavement keep me company. Ideally I’d be facing the window as I did in my previous study, and I’d rather have had it idyllically looking out on some form of green, but that view is not mine yet. I’ve often dreamt of acquiring a writing lodge like Virginia Woolf’s, looking over the South Downs. For Woolf, interruptions to her writing were the Church Bells next door and school children, in my world, it’s less romantic; it’s the blare of football from next door and some odd form of soul music from across the road, I do enjoy listening to an opera singer who lives further down, it’s just unfortunate that she doesn’t live opposite me. The writer or artist appears to be a lonely character, one that is somewhat detached from the world, yet that is entirely impossible as it is the world from which one draws from. It is the pounding of feet outside the window, it is children laughing as they chase one another with the parent screaming “stop, get back here!” it is the annoying yells and thumps from enjoying the football and the post man’s stagger as her braves the rain. The artists’ world is no different to anyone else’s but it’s their duty to use it, and that’s why they desk or writing nook becomes they’re little world.